The adjacent chart shows the price movement of MCX aluminium continuous contract. 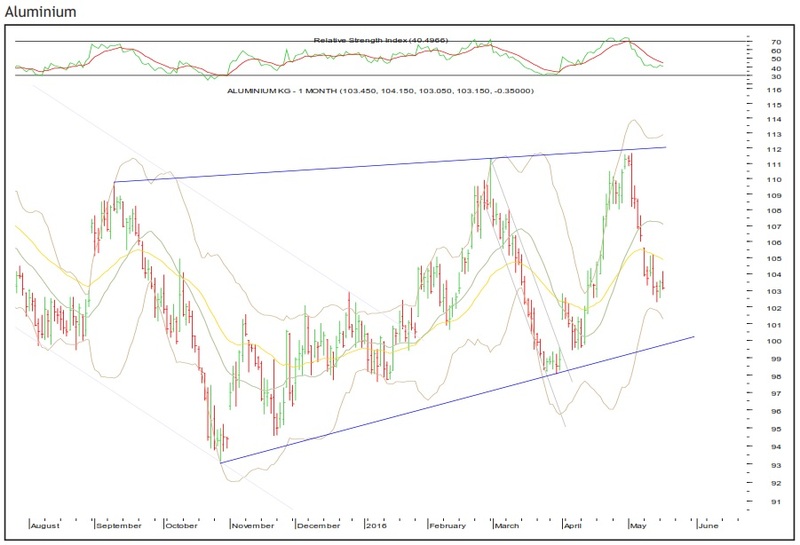 In the beginning of April, aluminium broke out from the upper end of the falling channel. Since then the base metal was rallying towards north. It reached near the previous high and a rising trendline from previous highs, where it faced selling pressure. Structurally, it has formed a large triangle. Currently, the base metal is falling from the upper end of the pattern towards the lower end, which is near Rs 100. The daily momentum indicator is in line with the price action. The fall is breaking up into lower degree waves. A key resistance level is Rs 104.20-105.20, whereas Rs 102.30 and Rs 101.30 will act as intermediate supports.